BBMP uses 50-year-old maps to identify encroachments. Here’s why. 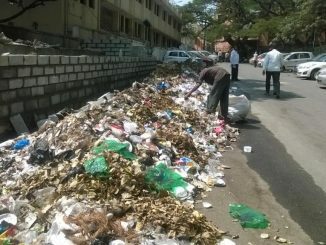 The Bruhat Bengaluru Mahanagara Palike’s demolition drive against properties built on storm water drains in Bengaluru city has raised questions over the loopholes in the system that led to encroachment of government properties over the last few decades. Even as the authorities are now accusing the developers and citizens of encroaching the public property, how did all this happen over the years? What are the ambiguities in the system that led to easy encroachment of storm water drains or any government land for that matter? Survey, Settlement and Land Records Department is one among several other government agencies that miserably failed to carry out their duty in preventing the encroachment. The department which is supposed to survey and settle the land issues once in every 30 years, has not updated the revenue map in last five decades. A senior officer from the Survey Department on the condition of anonymity, explained the complexities of land survey and how things have gone wrong over the years, to Citizen Matters. “An elaborate land survey was made in Karnataka from 1902 to 1920, during the British regime. Post-independence, the State government did a resurvey of the land across the State from 1958 to 1965. Any changes in the classifications of land (dry, wet, garden) and Kharab (A and B) were made keeping the previous survey (1902) map as the base. Again, 112 villages of Bengaluru (core Bengaluru area spreading across 131 sq km) were re-surveyed in 1975. With the resurvey, the land classifications were corrected and changes in Kharab land were made for once,” he says. This is the reason why we don’t see much of encroachment issues in core Bengaluru area. The encroachments that we see now have all taken place after 1965. Karnataka Land Revenue Act, 1964 (Section 115) says the term of settlement will remain in force for a period of 30 years. That is, the Survey Department has to do resurveys and settlement process once in every 30 years due to changing property of the land, which has not been done in Bengaluru. Why no land survey in five decades? So why did the Survey Department escape from its responsibility and how would things have been different if the surveying was done on a regular basis? The officer from Survey Department says the reasons are many. “There should be political support and administrative will to carry out the survey.” Elaborating the same, he points out at how the land survey opens up a can of worms. Recalling the resurvey process in Maddur and Belagavi, he says people were not ready to accept what was evident. Despite encroaching the land and the village map reflecting the same, they did not budge to the Survey Department’s contention. They would argue that survey is full of flaws. In addition, the survey method followed in early and mid 20th Century is way different from that is followed now. Earlier, the land was measured using Chain and CRA staff instrument and boundaries between two properties were demarcated through the bunds. The width of a bund was generally upto 6-8 feet and landowners were not really bothered about error percentage in measuring the property, for they had the land in plenty. But now, survey process is made using modern technologies, where land is measured in centimetres and millimetres. Naturally, the accuracy level is higher compared to previous surveys. If at all now the survey is made referring to the old revenue maps, land owners would question the Survey Department, even if there is a slight change in the measurement, say by one feet (in case if they are on the losing side), the officer observes. “In such a situation, the Survey Department cannot take up the survey work without the government backing,” he says. However, he admits to the Revenue Department’s failure to perform its statutory obligations. “As urbanisation began, we should have initiated the process of city survey. It should have been a continuous process. If at all we had done the timely surveys, encroachments in Bengaluru would have been avoided or at least cleared from time to time,” he accepts. Since encroachments that we see at present, in all probabilities, happened after 1965, what allowed people to encroach the government land like storm water drains and lakes? The root cause of the problem lies in the land transaction process. An officer from the Revenue Department explains the flaw in the system. During the land registration, the registering authority expects only the documents pertaining to the boundaries of transacting land and does not insist for field verification or documents from Survey Department. Till 1999, even the Karnataka Land Revenue Act did not make it mandatory for the pre-mutation sketch (Also called 11E sketch. It’s applicable to private land where the seller and purchaser can confirm the presence of land parcel by doing a physical survey through a licensed surveyor). “The Registration Act which is a central act, does not demand any field verification before registration and relies only on the documents produced during the registration. Till 1999, for instance, if a landowner had 10 acre of land and if he divided it into 10 parcels (1 acre each), the registration authority allowed him to sell it to any number of persons, which could be more than the total number of parcels. There is no mechanism or provision in Registration Act that prevents him from registration,” he explains. Podi is legal and actual subdivision of a land by physical survey and creation of land records based on that survey. But as per the Karnataka Registration Act, the Revenue Department, through Survey Department should complete ‘podi’ after mutation to create a land record in the name of purchaser. But due to lack of manpower, lakhs of cases were pending for ‘podi’ and thereby made the problem more complex. Therefore, the property in which you have built a house now, might be on an encroached rajakaluve with or without your knowledge, thanks to the landowner, who decades ago converted his agriculture land and sold to buyers without much hassle. What’s the way forward towards solution? The officer from the Revenue Department says that the process of land transfer can be effective and transparent by integration of Survey, Revenue and Registration Departments. “Integrating softwares such as MOJANI, BHOOMI and KAVERI (an IT project by Department of Stamps and Registration for lands valuation) can help maintain accurate records by avoiding human intervention. There is also a need to relook both the Land Revenue Act and Registration Act so as to bring in rules which will help us to move from presumptive title concept to conclusive title concept, though it appears almost impossible to implement in India,” he says. Presumptive title is considered as the root cause for land problems in India. Land ownership titles in the country are not conclusive proof of ownership, but are evidentiary or presumptive proof. Conclusive land title system makes the State government guarantee the title to one’s land. The officer from Survey Department sees solution to the muddle in the form of Urban Property Ownership Records (UPOR). UPOR, an ambitious project of the Revenue Department intends to provide property ownership card to the owner of private land based on the physical survey and on producing all legal documents to claim the ownership of the property. It stands as a proof of the property ownership. The officer says that the project which is currently underway in three cities – Shivamogga, Mysuru and Mangaluru, is yet to take off in Bengaluru. “While the project has been quite successful in Shivamogga due to public cooperation, we are struggling to implement it in Mysuru and Mangaluru as people are opposing the project,” he says. Will UPOR be implemented in Bengaluru to put an end to the land issues? The Revenue Department wants to introduce this, but is facing lot of hardships in the process. “We are yet to start the land survey in Bengaluru. With the city facing lot of encroachment issues, we need the government support to initiate the project. If the project comes into force, it will solve 99 per cent of the land problems. But clean records won’t help land mafia, that’s why the resistance,” he concludes. These are the issues in the Revenue Department that allowed land encroachment in Bengaluru over the past few decades. Now, how did the local planning/governing authorities – the BDA and BBMP – mess up with the system? – In the next story. Or you can devour both! Read on to know what’s on offer this week for cine-goers in Bengaluru.